I'm always so thrilled when clients return to get just the perfect piece to "tie it all in" for their space! It is so heartwarming to be able to share that creative process and experience with them. In this case, the clients had purchased this French Provincial side table set in layers of Annie Sloan Chalk Paint in Olive, Greek Blue, and French Linen, and also had other neutral creams / "greige" pieces / French Linen / some distressed looks that they are fitting together. They sent me photos of these gorgeous items they have already incorporated, and it was such a pleasure to get to research and collaborate on the various different styles that were available to help blend in with those existent pieces! 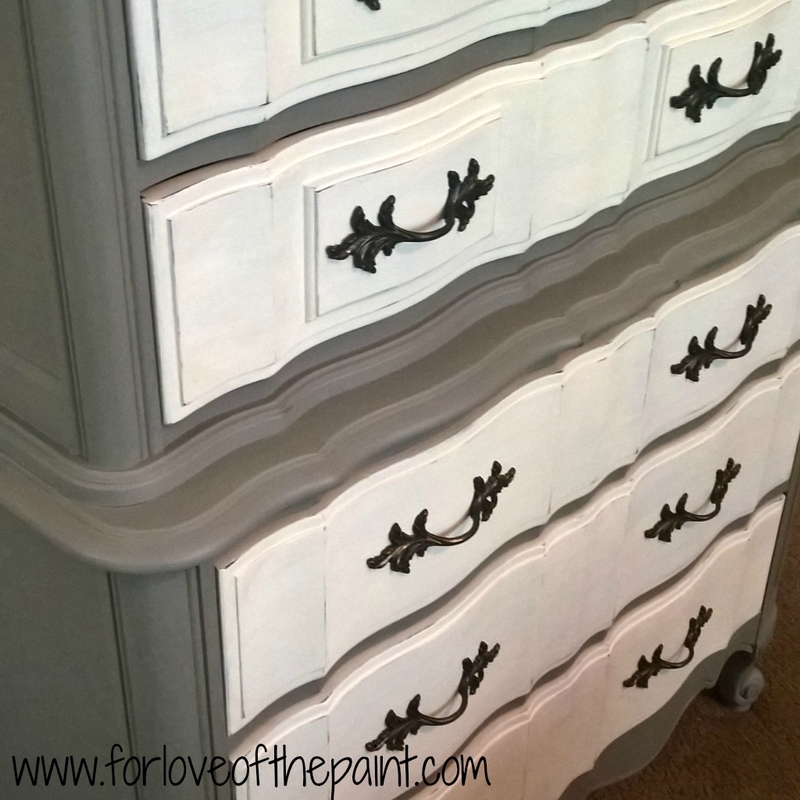 They decided on French Linen for the body of the chest, with Old White on the drawers. How did I get this look? 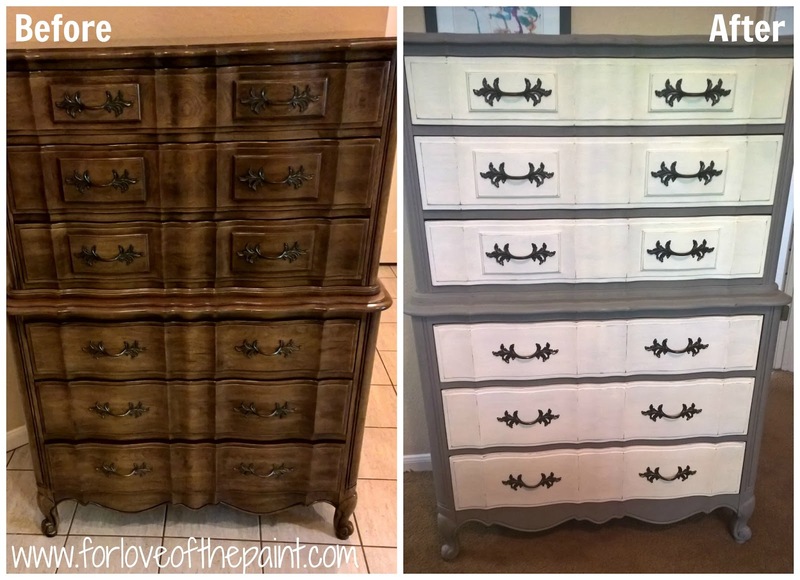 Read more (plus see the Before and After!) by clicking below! Since the clients really like the way the wood looks when it shines through a little, we did two coats of Old White on the drawers - this gives a little bit of translucence to the finished piece. (If what you want to achieve is a more opaque finish, I would recommend three coats of any of the lighter Annie Sloan colors - once you apply Clear Wax, the translucence will be even more apparent than when you initially paint.) For a subtle dimensionality, we also put a slight color was of French Linen onto the corners of the drawers before a gently distressing at high points and waxing. For the body of the chest of drawers in French Linen, I first applied a full strength base coat. For the second coat, to have a consistent feel, I used a damp brush for a semi-wash application so that it had a small bit of translucence as well, and just the most subtle amount of wood still peeked through. 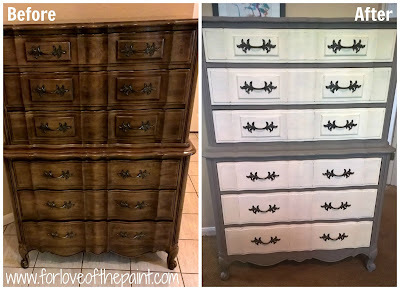 If you're near the Austin, Texas area and are ever looking for a custom refinished piece of your own, email me at forloveofthepaint@gmail.com! Check out my available pieces for custom refinishes, or send me pictures of your own furniture that you'd like restyled! This is gorgeous!! I love the way the new colors make it pop.